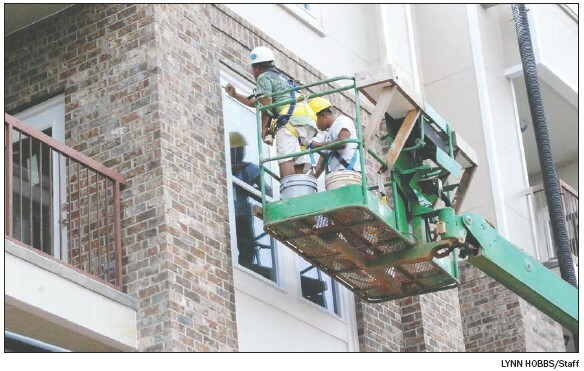 Workers with AK Painting prepare windows in a new unit at Sumter Station Apartments. Some new residents may start moving into the Sumter Station Apartments in downtown Eatonton in April and all of the 62 apartments will be available by May, according to managers’ estimates. The apartments have been under construction for about a year and there had been a waiting list of about 300 people wanting to live there; but that list has gone down to about 70 now, said Laura Bennett and Regina Davis, regional managers for Tishco Properties. Based in Valdosta with a satellite office in Atlanta, Tishco Properties has more than 35 years of experience in property development and management. Tishco owns/manages more than 55 multi-family properties in the southeastern U.S. The Sumter Station Apartments are built through tax credits and will provide housing for people with lower-paying jobs. The housing is not Section 8, nor will the rent be subsidized by any government, but there is an income limit to be eligible to live there, Davis said. “Rent is based on income. There are limits to how much you can make, but you do have to make a certain amount,” she explained. To receive the tax credit, Tishco is required to rent to people whose income is 50 to 60 percent of the area’s median income, according to previous Eatonton Messenger reports. It usually takes approximately one week for approval after applying for residency, Bennett said. The most common reason for not being approved are being over the income limit or not passing the criminal background check. “Crime and credit,” Davis summarized in answer to the question of why a person would not be accepted. Until construction is complete, the rental office is located on the Putnam County Courthouse square in the old bank building across from Blackwell Furniture at the corner of North Madison Avenue and Marion Streets. Property Manager Samantha Wynn is there accepting applications for residency, 9 a.m. until 5 p.m. Monday through Friday. Sumter Station has one, two and three-bedroom apartments that are spacious, Davis said. Ceiling fans, refrigerator, dishwasher, stove and microwave are included; and there are washer/dryer hookups. The living room and master bedroom have doorways that open up to the balcony. The complex has a covered picnic area, computer lab and a nice community room.